The definition of translation. Molecular biology and biology genetics provide the following definition of translation in biology. 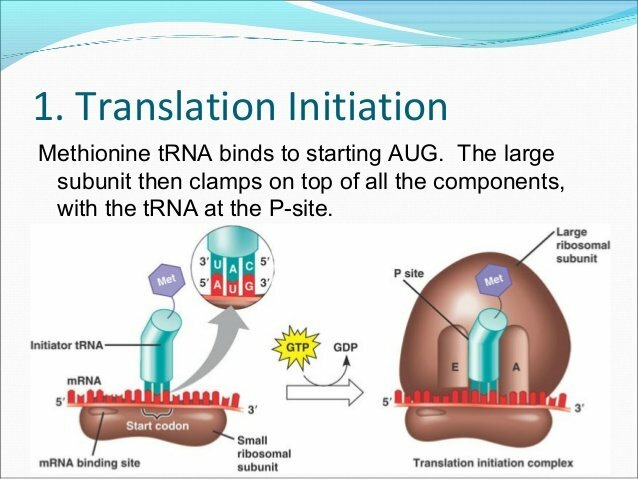 Translation means the process of translating an mRNA (messenger RNA) sequence into amino acids. As most cells are made up of protein, DNA translation is a fundamental process for cells creation. Some people claim that there are four phases of translation: initiation, elongation, translocation, and termination. However, most scientists believe that there are only three steps of translation in biology. The same notions are used in the process of transcription for describing the process of making the mRNA string. The difference is that in translation the polypeptide string is created. Let have a closer look at these steps. At this phase the tRNA, the mRNA, and the amino acid are combined in a ribosome. The tRNA attaches to the start codon, that is the set of three nucleotides that begins the coded sequence of a gene and specifies the amino acid methionine. Methionine gets into the ribosome by attaching to the tRNA with the right anticodon. The start codon is AUG. UAC is its anticodon. If you don’t know about this, you should pay attention to the rules of complementary base pairing. When the tRNA attaches to the codon AUG, the methionine is attached to tRNA. As peptide bonds are created, more amino acids appear. Their chain becomes longer. Thus, a polypeptide is formed. A tRNA and the amino acid enter the ribosome. If the anticodon matches the mRNA codon, the ribosome will link two amino acids together. If they don’t, the wrong amino acid is rejected. Linking amino acids together, the ribosome moves them forward. The procedure is repeated when the next pair on the tRNA and the amino acid enters the ribosome. If the ribosome reaches one of three stop codons, it won’t have a corresponding tRNA. Thus, proteins will stimulate the release of the polypeptide chain. Protein release factors recognize stop codons only when they appear at the A site. The A site is called so because it binds only to the incoming aminoacyl-tRNA (the tRNA which brings the next amino acid). The ribosome releases from the mRNA. Its subunits dissociate. Small ones will connect with the new combinations of tRNAs and methionine. A new translation will begin. Thus, we can make a conclusion that there are two steps of gene expression: transcription and translation. Transcription is the encoding of DNA information into RNA molecules. Translation is the encoding of information of mRNA nucleotides into a sequence of amino acids in a protein. As for the eukaryotes, transcription and translation are separated in time. They also take place in different places. The process of transcription of DNA into mRNA takes place in nucleus. The process of translation of mRNA into polypeptides occurs on polysomes in the cytoplasm. As bacteria don’t have nucleus, the processes of translation and transcription occur simultaneously. Make sure you can answer the following questions. If not, read this information one more time or get some professional help from the best biology tutors. 1. How can you define the notion of translation? 2. What steps of translation can you name? 3. What is the role of the mRNA in the process of translation? 4. What happens when the ribosome sees the wrong anti codon? 5. When do protein release factors recognize wrong codons?